This web page took time to scan, research, design, and upload. Thank you for supporting the Virtual Steam Car Museum! Shop at Amazon and Donate to the VSCM. 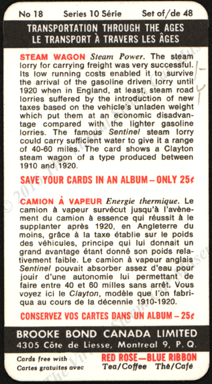 The Clayton Steam Wagon was an English lorry built between 1910 and 1920. 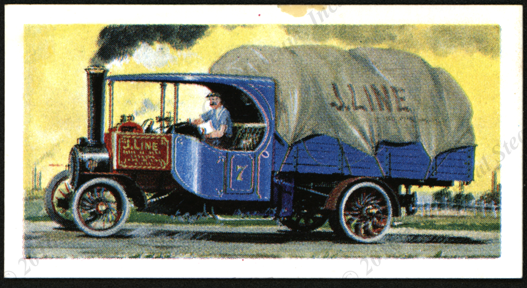 This premium card shows a Clayton Steam Wagon, made in England between 1910 and 1920. Brooke Bond Canada Limited in Montreal was the publisher. 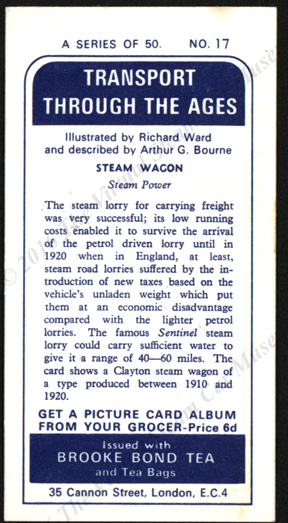 This premium card shows a Clayton Steam Wagon, made in England between 1910 and 1920. Brooke Bond Tea, London was the publisher. 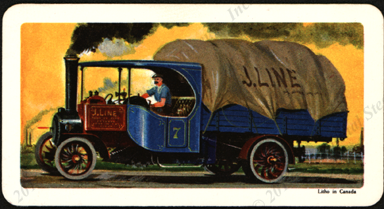 Subscribe to the Virtual Steam Car Museum Newsletter! Contact us if you have additional information about the Clayton Steam Wagon or if you have questions. Thank you for your financial support. The Society of Automotive Historians bestowed its prestigious 2015 Ingersoll Award on the VSCM web site. Please make your tax-deductible donation today to help keep the VSCM growing.